I heard about this sheet and TD-001 about a month ago and got my hands on one in almost no time. Turquoise Decals is new in the market and they entered it with TD-001: Turkish Air Force Numbers and this sheet, and what an entry it is! The sheet has been designed by Turquoise Decals and has been printed by Microscale. The register is excellent, the red in the Turkish flag is in the correct shade and guess what, the dimensions of the Turkish flags are correct! This was a serious problem for modelers since a very long time because even the local companies were missing the target when it came to the correct red and correct dimensions. 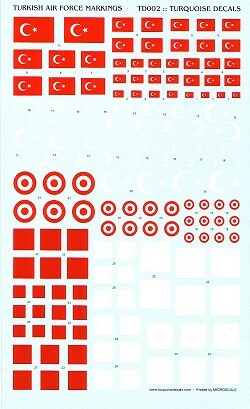 Rectangular Turkish flags used after the end of II. World War. These come in 8 sizes. There are 3 or 4 pairs of each size except the larger ones with only one or two pairs. White star-and-crescents used on red painted rudders before the end of II. World War. These come in 9 variants. The sizes of Turkish star-and-cresecent are given by a law but even Turkish aircraft sometimes carried non-standard flags, for example Spitfire Mk.Vb Trops. A few pairs of decals for such aircraft are included as well. Square roundels used before early 1970’s. These were changed in favour of the circular roundels after a recommendation by NATO as it was feared that these could be confused by the red star of the Soviet Air Force! These come in four sizes. Turquoise Decals give the red and white parts of these decals separately because as it was with the flags, non-standard insignia were more common! Normally, the ratio of sides of the inner red square to the outer white square is 5/7, but 6/7 or 4/7 insignia were also present. With these decals you can come very close to the real thing by applying combinations of the white and red squares given (see the scan). Circular roundels used after early 1970’s. These come in 3 sizes because these were used pretty much within the standards, there weren’t non-standard applications. I cannot tell you how much pleased I am that this sheet is finally there. For years, we in Turkey had been struggling to get our kits dressed in local outfits, but there were scarcely any decent decal sheets to do so. The only exception to this is the sheet by Zotz Decals that has the decals for all the F-16 units in TuAF service. What is also nice about this sheet is that you have a guide telling you which decal combination to use with which aircraft type. All the airplanes and helicopters that have entered TuAF service since mid-thirties are listed (yeah, Hurricane, Spitfire, F-84, F-100 and even He-111 and Fw.190 are there!). Spitfire and Fw.190 in the same air force? Yes, that is so correct! All in all, I think this sheet is a winner. I think this sheet is a must for all TuAF enthusiasts. Buy one asap, because I am told it is selling fast. Turquoise Decals even have a poll in their web sites for what subject should TD-003 cover. Can Turkish stencils or Turkish Stars decals be far away?